In Liverpool’s Leaf venue, Aidan Moffat & RM Hubbert have a perfect home for songs from their warm and wry new record Here Lies The Body. 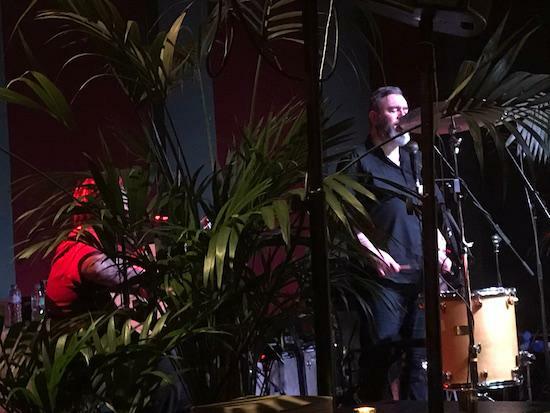 “It’s the first time I’ve been upstaged by a potted plant,” says Hubbert from behind the foliage that flanks them, to a crowd lit by candlelight and sat on mish mash of tables. Above them, the ceiling is covered by disco balls. ‘Fireside’, the first track from Moffat & Hubbert’s forthcoming Ghost Stories For Christmas, opens the set with a flourish. Tonight they’re joined by Jenny Reeve on violin and occasional vocals, and her strings soften the edges of Hubbert’s deft acoustic guitar into something beautiful and transporting. Moffat’s rich, deep vocal joins them as they flick smoothly through to ‘Cockrow’. ‘Mz. Locum’ follows with the singer adding a rhythmic kick on the single large drum that stands in front of him, alongside a cymbal and two microphones, one of which distorts his voice when a whispering aside should be needed. It’s these deft twists of tone that makes the pair brilliant – they talk about ill-advised Mexican dinners or Moffat’s ever-shortening shorts on his summer tour with Arab Strap and then play songs that are tender, bare and often deeply sad, without letting the atmosphere stray from an overriding sense of warmth. They can rib each other over false starts, play childishly with the plants on stage, or tease the audience for not loving Blackpool as much as they do; we are with them all the way. Right at the end comes perhaps the set’s highlight, a cover of Rosalie Allen’s ‘Hitler Lives’. It’s introduced with a reference to the attempted far-right march that was recently chased from the city by a righteous counter-protest. “Hitler lives / If we forget our fellow man / Hitler lives,” sings Moffat as civic pride fills the room, another tender flourish from a show that’s brimming with emotion. It is sad, funny, mournful and proud; it moves its audience in every way.